Native to tributaries of the lower Amazon near its mouth in Pará state, northern Brazil. The various L-numbers assigned to this species represent distinct populations with L004 (juvenile) and L005 (adult) collected from the rio Tocantins near Cametá, L028 from the rio Guamá at Ourém, and L073 from the rio do Pará in Portel municipality. Like many fishes that naturally inhabit running water it’s intolerant to accumulation of organic pollutants and requires spotless water in order to thrive, therefore weekly water changes of 30-50% tank volume should be considered routine. Wild specimens are likely omnivorous but with a preference for aquatic invertebrates and suchlike. In the aquarium it does best when offered a varied diet comprising sinking dried foods, frozen Daphnia, mosquito larvae, chironomid larvae (bloodworm), and prawn/shrimp, for, example, while juveniles will also accept some fresh fruit, parboiled potato, etc. Home-made foods using a mixture of natural ingredients bound with gelatin are very useful since they can be tailored to contain fresh vegetables, Spirulina or similar plus meatier ingredients. 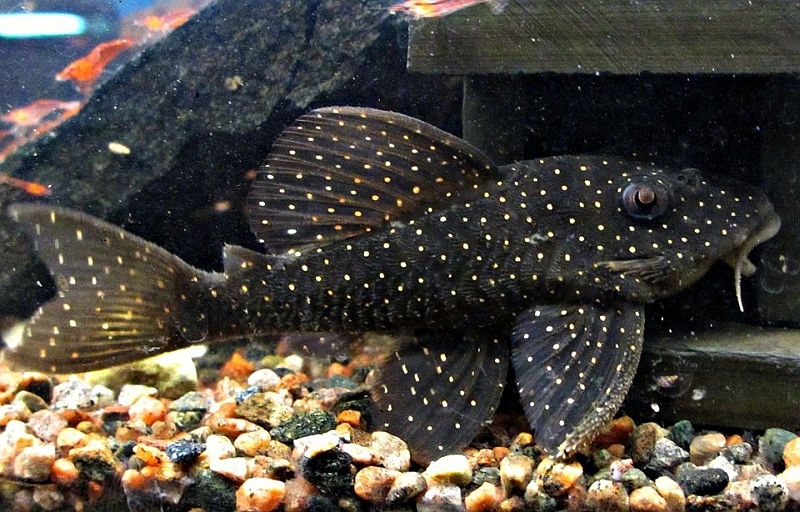 A peaceful species which can be maintained in a well-chosen community but is territorial towards conspecifics and other similarly-shaped fishes. It should not be maintained alongside other Hypancistrus spp. in order to prevent hybridisation. Males are also more slender than females, a difference which is easily observed when the fish are viewed from above. Cave-spawner with the male responsible for brood care and has been bred in aquaria on numerous occasions. This unidentified species is sometimes traded under the false name ‘Peckoltia angelicus’. The genus is otherwise remarkable for the fact that the majority of species have not yet been described to science although many are well known in the aquarium hobby. As of January 2016, there are eight described species in the genus: the type species H. zebra Isbrücker and Nijssen 1991, H. inspector Armbruster 2002, H. contradens Armbruster et al. 2007, H.debiliterra Armbruster et al. 2007, H. furunculus Armbruster et al. 2007, H. lunaorum Armbruster et al. 2007, H. margaritatus Tan & Armbruster 2016 and H. phantasma Tan & Armbruster 2016.